Anand has provided plenty of coverage of transcoding quality in the desktop SNB review, using Arcsoft’s Media Encoder 7. For the mobile side of things, we’ll turn to CyberLink’s MediaEspresso 6—a similar package that’s useful for quick encodes of movies for YouTube or mobile device consumption. NVIDIA has been touting the benefits of GPU acceleration for such tasks for over a year now, with CUDA making a fairly decent showing. 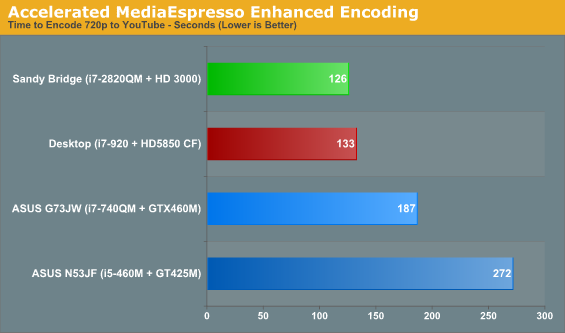 MediaEspresso also supports CUDA acceleration, making for a nice head-to-head, though I’m limited to hardware that I still have on hand. For the encoding test, I’ve grabbed two other recently reviewed notebooks to show how they compare to Sandy Bridge. The first is ASUS’ mainstream N53JF notebook, sporting an i5-460M and GT 425M GPU. For the higher performance notebook offering, we’ve got ASUS’ G73Jw with i7-740QM and GTX 460M. [Ed: Sorry for the delay in shipping it back, ASUS—it will go out this week now that we’re done with Sandy Bridge testing!] I used a 720p shot with an iPod Touch and transcoded it to a 2Mb 720p YouTube compatible stream. 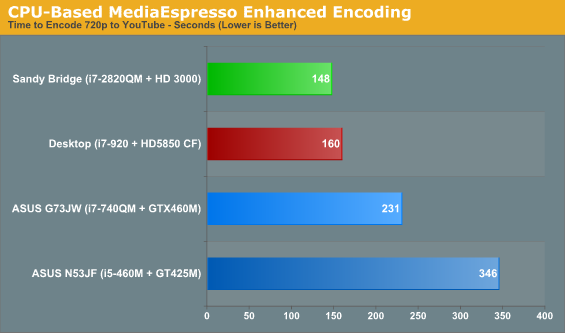 MediaEspresso also has some video quality enhancement features available, dubbed TrueTheater AutoLight, Denoise, and HD. I ran the transcode tests with and without the enhancements enabled, with and without QuickSync/GPU acceleration. 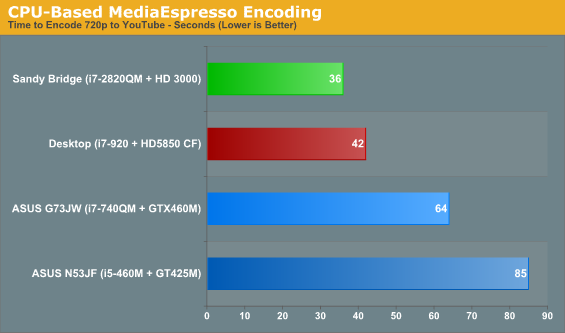 Since MediaEspresso also supports ATI GPUs, I tossed in results from my i7-920 with CrossFire HD 5850 as well. First things first, I’d say it’s fair to state that the GPU acceleration for AMD GPUs (at least in this particular instance) isn’t as good as NVIDIA’s CUDA or Intel’s QuickSync. Perhaps future driver, hardware, and/or software updates will change the picture, but the HD 5850 cards in my desktop fail to impress. 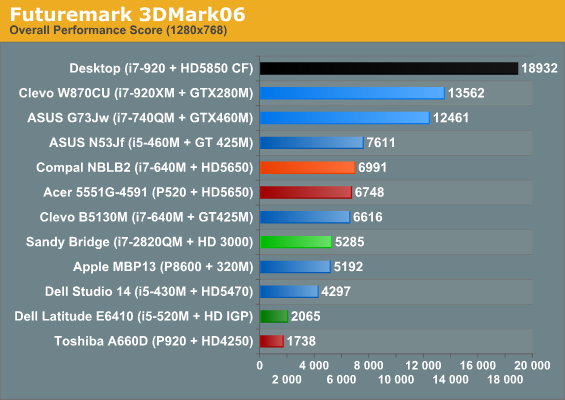 The CUDA results for GTX 460M are quite good, while the GT 425M was roughly on par with CPU encoding on a quad-core (plus Hyper-Threading) processor. Finally, Intel’s Sandy Bridge manages to easily eclipse any of the other systems—with or without QuickSync. Using pure CPU encoding, the 2820QM finishes the transcode in 15% less time than a desktop i7-920, and 44% less time than the i7-740QM. Enabling all of the extra TrueTheater enhancements definitely has an impact on performance (and depending on the video source may or may not be worthwhile). Sandy Bridge still required 8% less time than i7-920, and 36% less time than i7-740QM, never mind the i5-460M that requires 134% longer to accomplish the same task. Switch on all of the GPU acceleration support (including QuickSync, which isn’t technically a GPU feature) and all of the times drop, some substantially. The basic transcode on SNB finishes in a blisteringly fast 10 seconds—this is a 1:33 minute clip with 30FPS content, so the transcode happens at roughly 280FPS (wow!). 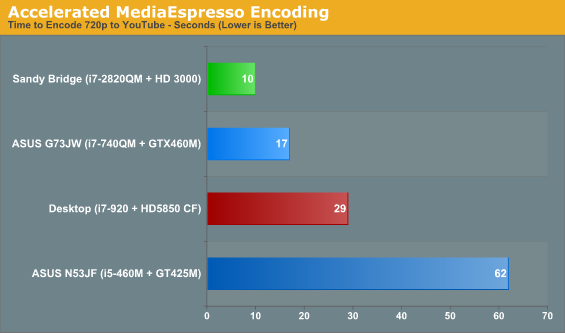 GTX 260M comes in next at 17 seconds (174FPS), then CrossFire 5850 ends up needing three times longer than SNB and almost twice as long as the mobile GTX 460M, and GT 425M brings up the rear at twice the time of the HD 5850. With the TrueTheater features enabled, the CPU appears to do a lot more work and the GTX 460M and Sandy Bridge are both over an order of magnitude slower. This is obviously a huge in for Intel, but of course it all depends on how often you happen to transcode videos—and how patient you happen to be. I do it seldom enough that even running encodes on my old quad-core Kentsfield CPU doesn’t particularly bother me; I just set up the transcodes in TMPGEnc Express and walk away, and they’re usually done when I return. If on the other hand you’re the type that lives in the social networks and Twitter feeds, being able to get your video up on YouTube five to ten times faster (without a significant loss in quality, at least based on my iPod Touch experience) is definitely useful. One final item to quickly cover is synthetic graphics performance, courtesy of 3DMark. 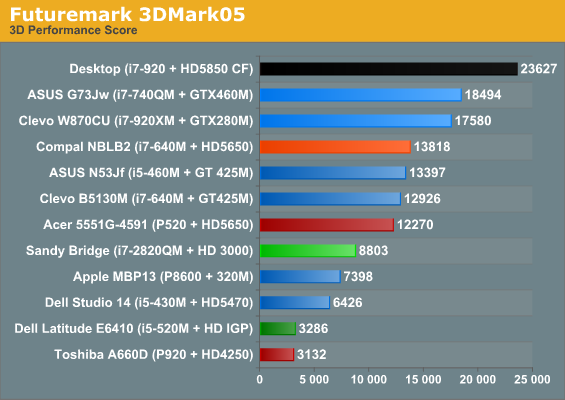 Sandy Bridge places in the middle of the pack, and obviously desktop solutions are far out of reach for the time being, but according to 3DMark we could see performance actually surpass some of the entry-level GPUs. 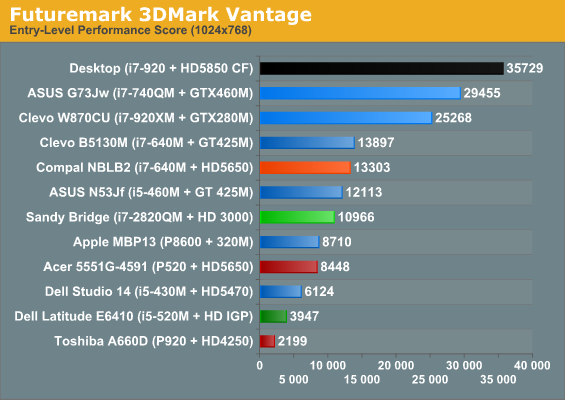 Maybe 3DMark just has heavy optimizations from Intel…then again, maybe they actually do have a GPU that can compete.